Entering the "dirty pond" or "down the drain", these expressions along with accompanying graphics are amongst a host of verbal expressions with their visual analogies which I have used over many Volumes to describe the status of the medical system as brought out in the views presented by the contributors to this blog thread over the years. 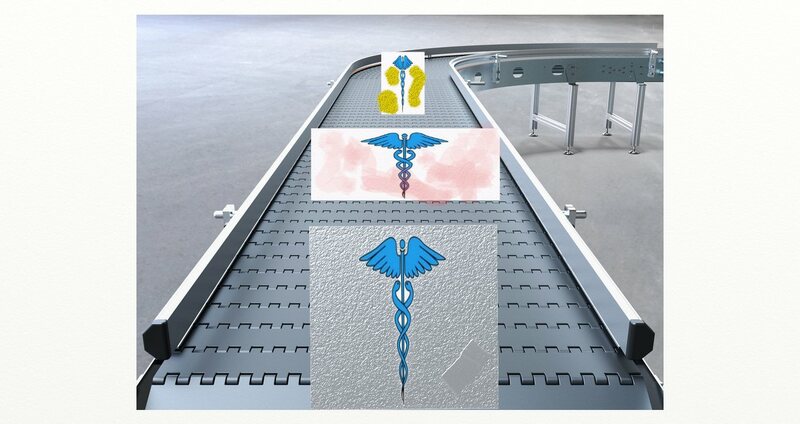 And now with Volume 94 comes another: the medical system utilizing the conveyor belt image within the process of diagnosis and treating of its patients. This analogy is spelled out in a "Perspective" description of a clinical event in the January 3, 2019 issue of the New England Journal of Medicine with the title of "Walking Away from Conveyor Belt Medicine". The story begins and the conveyor belt first starts moving when a community hospital notifies a major medical-surgical hospital that it found in a 70 year old demented patient who spends his life simply "walking" that his previously surgically stabilized aortic aneurism is enlarging compared to his previous checkup and he was felt to be in need of immediate surgical repair to prevent rupture. He was on his way by ambulance "and the conveyor belt started moving" in the major hospital to carry out all the preparations involved in what was to happen on the patient's arrival. On arrival "the conveyor belt is speeding up". Then the "belt was moving fast" as all the many components which were needed to prepare and carry out this risky surgery were proceeding and being accomplished. And, if continued to the anticipated end-point, the patient, elderly and demented would be dropped off onto the operating room table for the start of this surgery and..and.. but, fortunately the conveyor belt stopped running when time was taken for communication between surgeons and the family who arrived and that communication changed everything and it was decided that the risks of surgery was too great for this particular patient. So the patient was sent home with a pair of slippers for his walking and was alive 6 months later and carrying out his life as before his immediate life was governed by that medical system "conveyor belt". What impressed me about this article is a suggestion, which some may consider, that the medical system may have a tendency to be employing a "conveyor belt" mentality in its approach toward virtually all patients. And this uniformity of belief and action may be contributing to a loss of dignity to each individual patient involved in the system. "It's always done in this way and so that is how we will do it." That is, hopefully, until the patient or family intervenes and "speaks up". What do you think about this analogy? Do you see that you have been sitting on that fast moving "conveyor belt" within the medical system as a patient? ..Maurice.